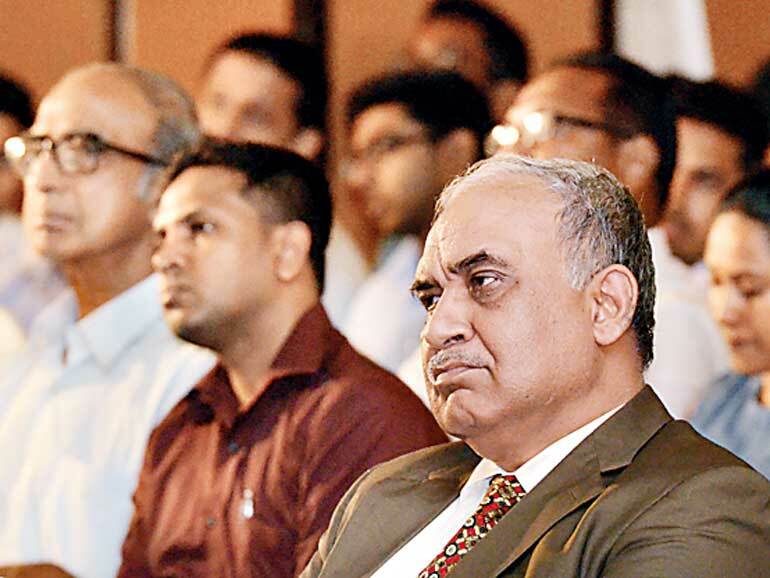 The Daily FT-MTI Thought Leadership Forum on Sri Lanka exports, titled ‘Sri Lanka’s Export Challenges,’ confronted the brutal reality of reasons behind Sri Lanka’s stagnant export growth, while evaluating its future with radical strategic options. The well-attended forum saw a large number of industry leaders, exporters and investors. 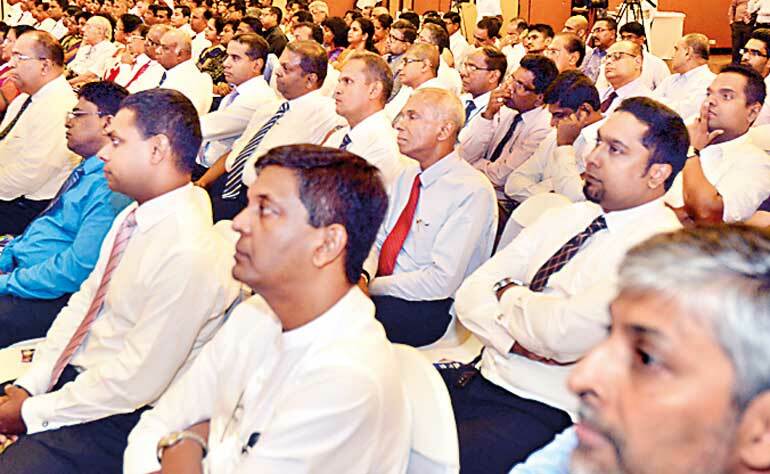 The forum featured a key presentation by MTI CEO Hilmy Cader on ‘Sri Lanka Exports — Confront Reality. Think Strategic. Or?’ which was highly commended by all stakeholders. The key presentation approaches was to confront reality, ask brutally hard questions, and explore radical strategic options with no shortcut answers on three key pillars — Where are we now? Why are we here? What’s our way forward? 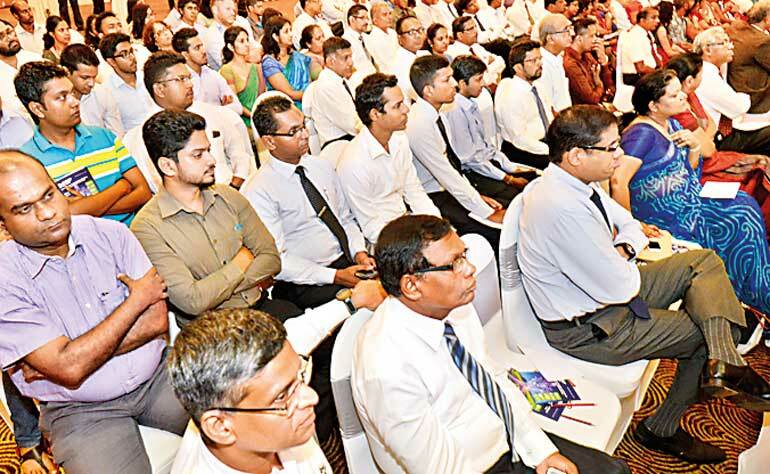 Highlighting on the importance of looking at the challenges Sri Lanka exports have, Cader said the country’s export sector is at alarming signs when considering the numbers, particularly when the economy is looking for a quantum growth. Sri Lanka had been practicing the ‘ohoma yang’ strategy for a long time and the figures really reflect the incremental approach of ‘ohoma yang’ strategy. He highlighted that having gone in ‘ohoma yang’ strategy for so long, at least now the country need to figure out the quantum change can be achieved. Sri Lanka’s exports as a percentage of the gross domestic production (GDP) have been drastically dropping in the past 15 to 20 years and exports growth has barely kept pace with GDP on a CAGR basis. He said 73% is still contributed by main income generating sectors – apparel, tea, rubber and coconut resulting in absolute fragmentation as 24 other sectors accounts for the balance 27%. With a combination of reasons Cader explained the seven key strategies such as economies of scale, R&D, hunger, exporter profile, policy, institutional framework and responsibility. He revealed that despite having over 3,700 exporters, less than 10 exporters have revenue of $ 100 million, which too is peanuts in today’s context and added that when there’s hardly any revenue it is obvious that companies couldn’t spend on R&D and product development. In terms of R&D expenditure, he said it was at very low levels. Despite tea being one of the major exports, the Tea Research Institute’s budget is about $ 2.5 million per annum which is very low compared to global standards when we try to compete with the international giants. It is a cycle; very low R&D, no value addition, basic goods as a result bound to get very low returns. High tech export contribution to total merchandise exports has reduced significantly from 2.2% in 2001 to a mere 0.9% in 2012. Comparatively, countries in the region depict significant high tech exports in their export portfolios. This is further highlighted with the minuscule R&D spend of Sri Lanka (0.2% of GDP) compared to the region. Moreover, contribution from branded exports to total exports has remained almost the same from 2005, highlighting the fact that basic goods contributes to a major portion of Sri Lankan merchandise exports. In terms of the ‘hunger’ for that big quantum growth, except for the top apparel exporters, the rest of the players in other sectors are not eager to achieve that quantum leap. “You can have all the EXIM banks, trade arrangements; but if that entrepreneurial drive is not there to grow, where is the growth really going to come from?” he questioned. He pointed out that Sri Lanka’s entire approach looking at the institutes that are involved in this procedure is spending enormous amount of energy resolving the operational problems in different ministries and institutions. However, solving operational problems of the exporters itself is not going to take us to the next level. Therefore, it time that we consider of two types of institutions – one to solve operational issues versus a think tank, which will work as a combination of investment bank and a think tank to uplift the exports to the next level. 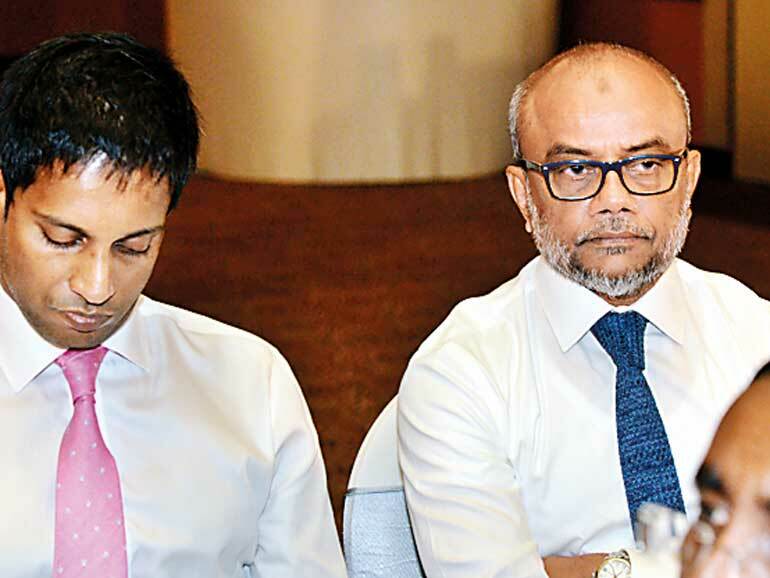 Noting that the top two apparel companies basically invaded the category, he asked if Sri Lanka needs more ‘category invaders’ like apparel to come into the industry and do what took place where apparel is concerned. He revealed that except apparel industry where the consolidation has taken place, all the other sectors are highly fragmented. In this backdrop, one of the biggest challenges we have to address is SMEs versus scale. “You can’t take the SMEs out of the business and leave 400,000 smallholders. There are social, economic and political implications on that. There is no easy answer, but on the other hand if we continue to be fragmented, we will not have the scale to compete. Therefore, is there a model somewhere in between? Is there an opportunity for Sri Lanka where we can be big and small at the same time, because there is no way that we can do away with the SMEs,” he explained. Cader also pointed that the definition of exports in Sri Lanka is very narrow as it only considers products as exports if value addition was done within the country and does not encourage Sri Lankan multinationals. However, he suggested that it was important to look at ways and means to encourage and develop more Sri Lankan multinationals. In addition, he revealed that there’s inconsistency in the way we measure some of the exports, particularly when it comes to the ICT sector. Although ICT is considered as exports, some of the other services such as medical tourism and foreign employment are not considered as exports. “ICT, all those numbers are based on export values and they don’t reflect the money generated. We have very conveniently put in some share services of the big conglomerates also to be counted when you look at these numbers because they are also considered KPOs and BPOs. However, the commodities still are the money spinners and not services,” he noted. He emphasised that the industry needs to challenge some of the issues especially in terms of allocating promotional budgets, which are extremely small by global standards as it has to be divided among large number of small enterprises. Also, the addiction to trade fairs and trade delegation is an area that the country needs to relook. Policy is an area we need to make some hard decisions in terms of going to the next level, he added. There are over 20 institutions in the export enabling and promotional ‘space’, but there’s hardly any coordination or synergies between them. He also emphasised on the importance of human resource development of export staff. From the perspective of an international investor interested in harnessing Sri Lanka’s export potential on a ‘ground-zero’ basis, the investor would have the obvious concern of ‘what really does Sri Lanka offer?’ Giving an answer to that, Cader elaborated on four key pillars — natural resources, human resources, location advantage and intellectual property on what Sri Lanka can export. In terms of natural resources he highlighted on agriculture, aquatic, terrain, climatic and mineral. He explained that the agriculture industry including aquatic is highly fragmented with a huge small holder base, low economies of scale and low R&D, thereby transforming into large scale, high-tech agriculture, R&D based niche product development especially in the spice sector is a challenge. While there’s healthy growth in tourism and infrastructure, given other sector plans there is shortage in the HR supply chain especially for blue collar jobs and the salary structure is not sustainable as well. With regard to human resources, low skill levels, language limitations had led to supply constraints in competing industries making negative socio-economic impacts. Thus upgrading quality of life, higher costs, higher value addition and up-skilling was important. However, to bridge short-term and lower skill gaps, Cader raised the question whether Sri Lanka should import labour and at what price points as it could lead to many socio-political implications. 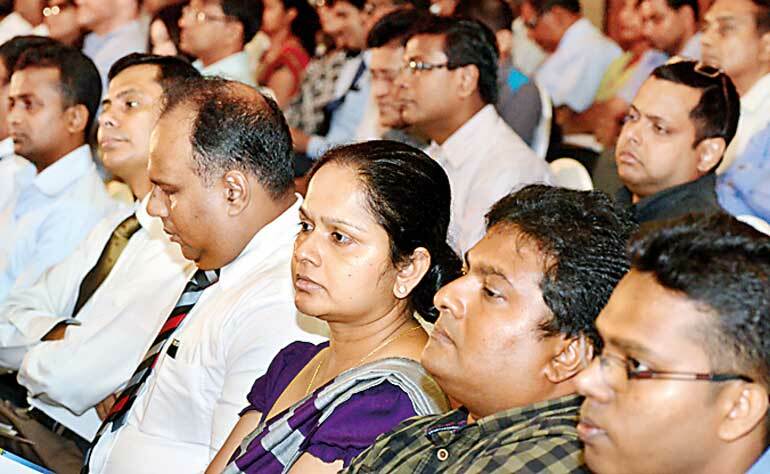 “Should Sri Lanka be a part of the Indian supply chain? Our egos may be very allergic to it, but the reality is you have a $100 billion market in your neighbourhood, but our egos are preventing us from even considering that. Other than our ego, what do we really have to offer? We may look weak in the beginning, but 50% of something is better than 100% of nothing,” he added. Citing a research MTI conducted on English fluency, he said out of 33,466 students entering a full time university degree or professional qualification, only 2,638 are eligible to meet the English fluency criteria. “We have absolute limitation where language is concerned, which means we have to invest in our educational supply chain and that’s not a short term fix. It’s a 15 to 20 year plan starting with the new generation — but if we don’t start today, we will continue to be in this short term,” he noted. As far as location advantages are concerned, he outlined on three areas such as transit port, regional hub and destination for value-added manufacturing and trading. He revealed that despite the healthy competition in terms of a sea port, Sri Lanka has a relatively strong model to make it more viable, but as far as air is concerned other than the South Indian traffic, options at this point are very limited in terms of a transit port. 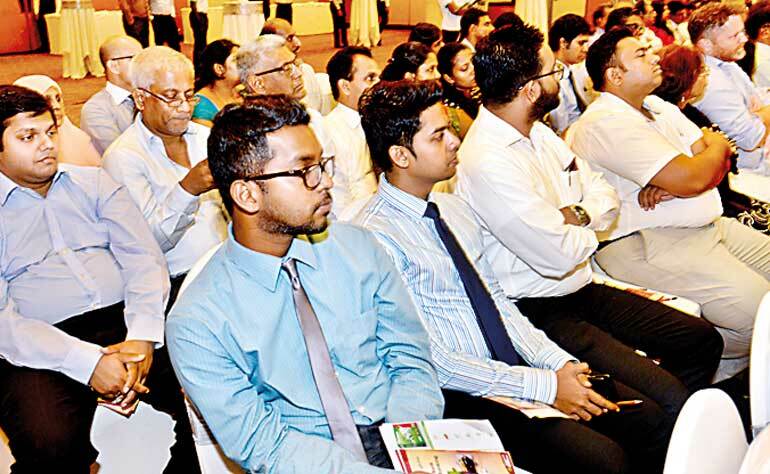 Sri Lanka is full of hype to become a regional hub, but to become a hub you need to think through in today’s world. That is something that we really need to think through and hard questions need to brought into light. In terms of becoming a destination for value-added manufacturing and trading, Cader said Sri Lanka has a very strong apparel model. Owing to the locating advantage, Cader suggested that it was one of the areas which Sri Lanka could score on and emphasised that it is critical to allow large scale multinationals to operate in the country to attract FDIs. “This is where EDB, BOI and all the other institutions have to take a holistic approach and maybe have demarcated zones with infrastructure policy and imported labour to facilitate those major industries,” he said. Noting that he had seen the tendency of taking the current $11 billion for granted, Cader cautioned that looking at the global challenges maintaining that $11 billion wouldn’t be an easy task. “The hard questions are not asked, because then you are seen almost like a traitor. But I think being a sincere critic is one of the biggest assets that any country could have. You need sincere objective critics and one day those questions will guide us towards the right option,” Cader pointed out. Following the key presentation by the MTI CEO, a panel discussion was held featuring Central Bank of Sri Lanka former Deputy Governor W.A. 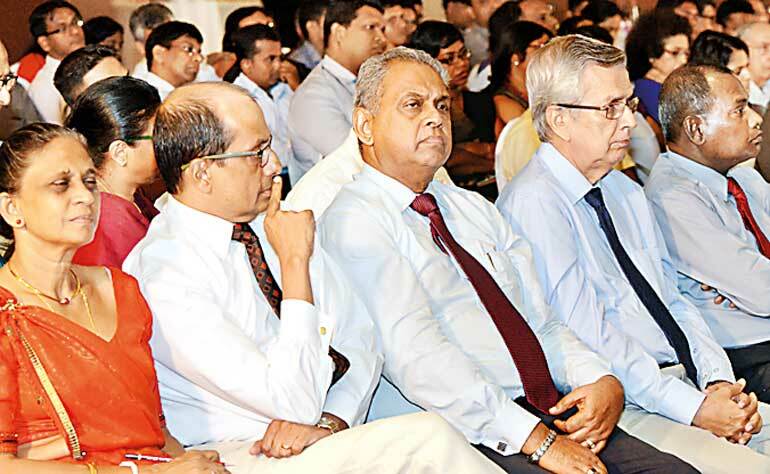 Wijewardena, Export Development Board (EDB) Chairperson Indira Malwatte, Lalan Rubber Chairman Lalith Hapangama and Empire Teas CEO Lushantha De Silva. The discussion was moderated by Daily FT Editor Nisthar Cassim. While commending, the panel also shared their observations and opinion about Cader’s presentation. 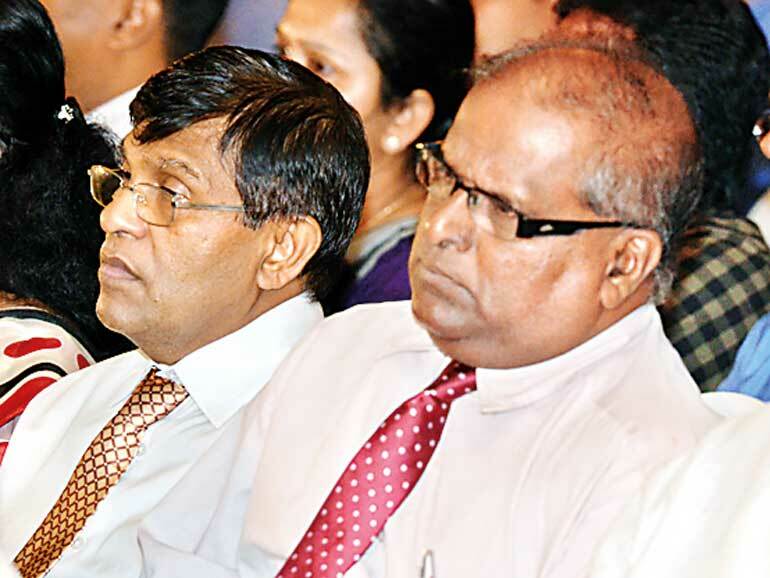 Wijewardena: I think Hilmy has sufficiently challenged the sleeping elephant. It’s up to the industry stakeholders to take his comments positively and not negatively. 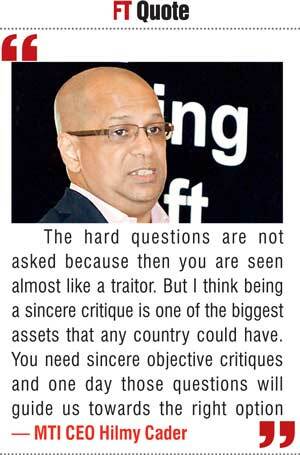 Positive questions there on operations objectively and take Sri Lanka forward. He very correctly positioned where Sri Lanka is today and our exports on concentrating simple products, where 95% of them today consist of simple products which can be copied by other people easily. That’s why countries like Bangladesh and Myanmar, Cambodia and Vietnam have easily copied us and now Sri Lanka is driven away from the export market. Hence, what we have to decide today is to how we can take Sri Lanka forward. Taking forward means we have to move into complex type of products which countries like Thailand are adopting and at the same time Singapore has been very successful in doing it. We have to now think how to meet the challenges that we face when we want to transform from Sri Lanka’s previous export sector. One important challenge is our labour force, which is basically good for stitching garments, nothing else. We have to develop the labour force markets into a production system, where they would be able to meet the challenges of producers and manufactures who might demand the type of labour and skills which we don’t have in Sri Lanka. Basically, I find that Sri Lanka’s education system has failed to deliver to us the type of labour force that would take Sri Lanka to the next stage. Starting from our school systems, universities, technical colleges and the vocational training institutions, they are all simply producing certificate holders. Hilmy very correctly analysed the type of labour we have in the country. Thereby, the basic challenge for us today is to develop the labour force, which cannot be done overnight — the Government will have to invest heavily in the education system not necessarily to produce certificate holders, but people with skills. Sri Lanka was to receive the IIT under the Comprehensive Economic Partnership Agreement (CEPA) which was completely forgotten sometime back, and now there is heavy protest from the professionals for ECTA. By protesting this, we are simply blocking our opportunity to move forward and now we are thinking we can uplift Sri Lanka to the next stage. We must now focus on developing our labour force not for the garment industry, but for the type of smart industries we are trying to develop in the future. Hapangama: I totally agree with Hilmy on what he outlined today. Further on the exports and the branding, that’s where we need to look at and there are two ways approach – build a brand or buy a brand. 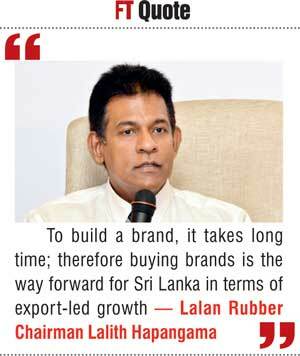 Now, my way of looking at it is, to build a brand it takes long time, therefore buying brands is the way forward for Sri Lanka in terms of export-led growth. Sometimes, we think that buying brands involves a lot of investment, it is not so. There are successful companies that had been buying brands in the past. A smaller company with a brand will give a head start. I think if you’re to concentrate a lot more in that area of branding, that’s one of the ways we could probably in the short-term market our products and have the competitive advantage in the marketplace. De Silva: To add on to what Hilmy mentioned in his presentation with regard to the tea industry, probably not the radical changes in the short-term ideas. 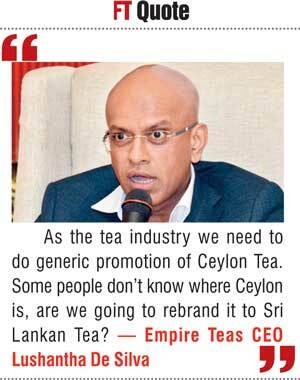 As the tea industry we need to do generic promotion of Ceylon Tea, promoting of major Sri Lankan-owned brands. Some people don’t know where Ceylon is, are we going to rebrand it to Sri Lankan Tea? On this supply side, tea planting and cultivation of new areas should be looked into such as automation tea plucking. If we look at the export side which we aren’t represented, some of us have invested in automation, but I don’t think it’s adequate. We really need to automate the whole process. Last but not least would be the automation of the auction system, which has not happened. There 100 to 200 people hang around for two days to buy tea, but if we really look at it, 80% of the exports are handled by 20 companies. Malwatte: A lot of food for thought, Hilmy. Since I took the chair in November last year, we have looked at all our action plans and we are somewhat heading towards what you described. We have tried to rationalise what exports we can double in the shortest possible run. For example, we are looking at apparel and helping at least another two to three brands to go international in the tea market, because those are main earners. We are looking at two markets outside the traditional markets of China and USA. We wouldn’t take the normal traditional route of exporting on all trade fairs and delegations you have mentioned. We are looking more at having a trading option where you can do online trading in those countries, where you have access to promote Ceylon Tea most immediately online. Those are the two initiatives we are doing with the Tea Board of Sri Lanka. Then in the case of rubber, everybody knows here that we have 40% of solid tyre in the international market, but what do we do with the automobile industry? Are we supplying sufficient accessories to the automobile industry? It can be a little part of the car, like a wiper or sealant which Sri Lanka can supply. I think we have understood Sri Lanka cannot manufacture from A to Z, we need to plug into the global value chain. We talk so much about the global value chain, but do we know the actual approach? What is the global value chain? What countries are we looking at? What products are we looking at? All those thoughts are now with the EDB, and are in the planning stage. It won’t be overnight, but I think we are moving positively, especially in terms of R&D. One great move we have done is, we have signed up with SLINTEC and they have started some clinics with the exporters. This is the first time the BOI and the EDB is under one ministry, where the BOI is also looking at investment targeting exports, that I think we are moving in the right direction. The Export Development Council of Ministers is one forum where all the ministries would be put together under the President and we all get on to an export drive. The way the country got behind eradicating terrorism in Sri Lanka, we have to take hard decisions as the only way Sri Lanka can survive is on exports. Are we going to depend on our remittances? Are we going to depend on all the women sending their little monies to Sri Lanka and having socioeconomic problems? How are we going to have the debt serving done? Are we going for further loans? 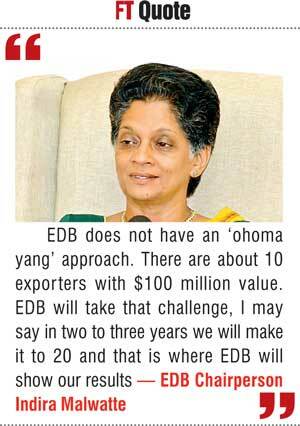 Thus, the only option the country will have as I see and as the EDB sees is we have to get into exports. It is not only the EDB, we value the exporters and we are also looking at a category; there are many people who have wealth, but they don’t have the idea or the way to get into exports. That is another category we are looking at. Can we get them to come into exports? How do we woo them into exports? Is it by getting some project profiles done to attract them? We did a similar operation when it came to diamonds in Sri Lanka. At the time we set up the diamond industry in Sri Lanka, it was the EDB which initiated a feasibility study and got a report done. At that time we paid a fabulous amount, but with that we were able to get 10 people to invest in the diamond industry; otherwise today Sri Lanka wouldn’t have had a diamond industry. Then, when it comes to the gems and jewellery industry, we have to take that hard decision which I think is in the process of happening. Are we going to completely liberalise gemstones to come into the industry to develop a cutting industry and laboratory industry and get the jewellery industry going? Again when it comes to the fragmentation of land, are we going to re-grow tea at a cost or are we going to use the underutilised and unutilised lands for growing of other crops? There are several crops, such as herbs, strawberries and so many other crops which can be far more profitable. So, these are hard decisions which we have started. We have started talking to the Ministry of Plantations to identify those lands and try to see whether we could give those lands. With regard to the land, there is a Paddy Land Act. On one side we say there is an overproduction of paddy, who is going to make that decision? Politically it is going to be very difficult; are we allowing paddy lands to be utilised for other crops? So, these are all hard decisions, which we are actually working on now and hopefully the EDB together with the necessary policymakers will be able to implement some of them. Q: The Export Council, which is the highest by the Statute, has it been reconstituted? Who is going to own this export thrust? What step is EDB taking in reconvening this Council? 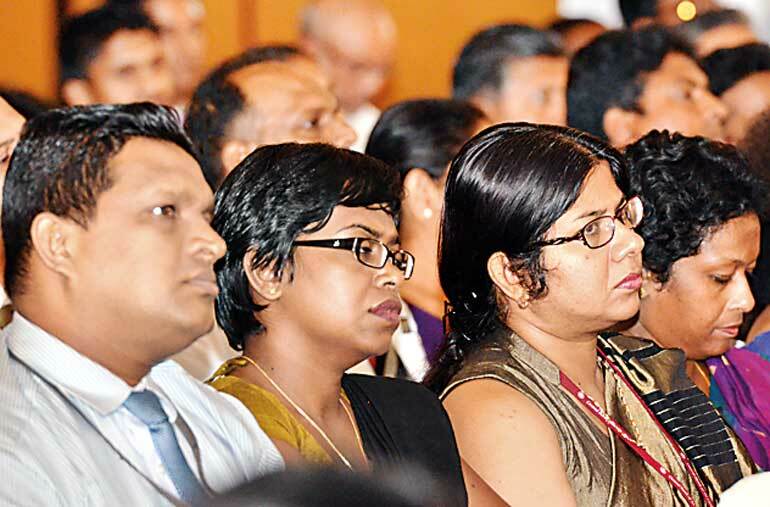 Knowing that Sri Lanka has a highly politicised system, will that Council be effective? Malwatte: We just prepared the Cabinet paper for that, which would hopefully be sent in the immediate future. We have already spoken to the highest of the lands and all the relevant ministries. We have constituted what the ministry should be and with that we are also preparing a National Strategy. It is with this National Strategy that we will have the first meeting of an Export Development Council of Ministers. Because there are several things that several ministries have to do and we have to buy in all those ministries. Then there will be a taskforce along with the Export Development Council of Ministers which will actually look onto those tasks and see if those things are done. Q: We are in a world where you could do your own research, produce and export. Do we need the Government to drive or shape policy? Do you need that traditional mechanism of Government championing a policy or should it be the private sector driving the policy? De Silva: If we look at tea, it is controlled by the Government. They need to liberalise it to a certain extent, not fully. Tea is more or less controlled. I don’t think there is so much red tape involved in other exports. Hapangama: In terms of rubber, I think we have the facility of importing raw material because right now our country’s production is about 85,000 tons as against the requirement of 150,000 tons. So we are a net importer; also we don’t have an issue in terms of the imports. But I think what we need to do is let the Government and Government agencies implement a system to have a level playing field for exporters. For instance, in several countries we are being charged 35% import duties as oppose to some of the new Free Trade Agreements that are coming up especially like TPP where most of these countries will have access to those markets on duty-free basis like US, Canada, Mexico, Japan, and all these developed countries. So how can we compete unless otherwise we have a level playing field? I think this is an area where we need to seriously look at and the Government needs to take immediate steps to implement that. I know it’s a long process, but if we don’t start now we may have a serious issue for our Sri Lankan exports in time to come. Wijewardena: I think the Government has a role but not too much of a role, because what I have observed is, wherever the Government has intervened in Sri Lanka, it has messed up everything. So I don’t want to see the Government intervene and mess up the export sector of the country, but what the Government should do is, it can have an overall export development plan which can be implemented over the next 20-year period, where we will decide that we will move away from the current garments, tea, rubber, coconut into the complex type of exports and provide the facilitating role and not the main intervention in the export market. It can be bilateral trade negotiations to provide market access to Sri Lanka’s exporters. Other than that I don’t think the Council of Ministers functioning under the President can do anything about the export industry in Sri Lanka. Q: How dynamic would this policy setting be? Will it be in the approach of ideas or follow the same standard checklist? Or are we looking at totally different approaches? Malwatte: Whilst having the traditional products, we were talking of professional exports, service exports. Now service exports are something that the EDB has not been actively promoting, but that will be actively promoted by us. For example, technical exports — Sri Lanka is very strong on hydro. We are now looking at new markets like in Africa for mini-hydros. It’s not that EDB has initiated it, but those companies are having certain issues, EDB is only a facilitator. When an exporter has an issue, the EDB is one of the institutes that will come to facilitate it. In terms of hydro, it was a little thing that the EDB had to do, but it was big business for Sri Lanka. We are also actively promoting the construction industry, because right now in Sri Lanka the construction industry has slowed down. Therefore, how the EDB looked at it was, how can we look at the possibility of exporting our construction industry as an export service? We are looking at Myanmar, some of the African countries, where EDB has already assisted. Not that they can’t go to those countries alone, but when you go as a group there is a presence felt of Sri Lanka. These are some of the new initiatives we are looking at. In terms of the spice industry, the same route the Ceylon Tea has taken. We are planning to brand Ceylon Cinnamon with the Spice Council and try to differentiate it with cassia and see what special properties Ceylon Cinnamon has to export — we are trying to see value addition coming in. You all know EDB has an import and export cess, all these monies should have been ploughed back into the industry. As an initial step, on the spice exports we just drafted along with the spice exporters how best we can plough back the cess that has come into the consolidation fund, whether we could take it to the EDB and give it back to the industry for their use, R&D to get into new products. I’m sure a lot of people want to find out about the organisation which is going to be formed very shortly, called the Development Agency for International Trade. Now that is going to be the think-tank that Hilmy was referring to. That will only be a think-tank, it will be for a period of three years to get the Sri Lankan strategy in, but you still have EDB, BOI and Sri Lanka Tourist Board with a new look trying to implement what comes out from this agency. So this agency will strategise it and these will be implemented. There will be a fresh thinking that will be coming in. Q: Traditional thinking is that exporters need to be incentivised. But given our fiscal situation, I think it is no longer possible. Can we continue to do this handholding exercise going into the new markets? Or even the existing markets? Hapangama: I don’t think we need subsidies; what we need is a level playing field in export markets. I’m sure lot of exporters would agree with that. De Silva: From the tea industry, we contribute to the Government promotional fund and I guess that needs to be invested in promoting tea or bringing it back to the industry. That’s what is required urgently. Q: Assuming in a situation where even the EDB expenditure gets cut, what should be the approach? Should the Government allocate more funding? Should the private sector basically find its own means? EDB funds exporters for certain trade exhibitions, should that continue? Wijewardena: What the Government should do is develop R&D because we are lacking in that area plus the development of the human skills. The Government has to allocate more money into that area rather than giving subsidies to individual sectors or individual businessmen. Well… in the past what you have done we can already see the results have not actually shown in reality that the money has been spent productively. Malwatte: It is not only EDB-organised trade fairs that we have, but we also have a program for exporters’ own marketing efforts, which all exporters are free to attend. They have their plans. Whatever an exporter wants, we can assist. Not only the EDB-organised trade fairs, we also look at what the exporter needs. We cater to their requirements. Q: Doesn’t the private sector know how to sell a product where the markets are? Should the EDB pamper so much? Malwatte: There are certain trade fairs where it is strange but all the large exporters are part of the EDB delegation. Obviously there is something in EDB delegations and trade fairs in which we participate. Still we try to give preference to the SMEs or the new potential exporters, but we have so many requests from the larger exporters because when they do participate in a trade fair which is organised under the banner of Sri Lanka and if it is organised properly with the necessary promotional material, then there is definitely strength in participating in a country pavilion. This is why still the larger exporters are battling with EDB when we say that you all have the expenses and we will help the SMEs. Now the demand from the larger exporters is so high that we are trying to re-introduce a category where we actually kept the larger exporters. In the short-run the larger exporters are the ones that can bring the necessary foreign exchange to Sri Lanka. Not that we will be neglecting the SMEs, we will assist the larger exporters. There are certain trade fairs where private companies won’t have access; it’s for the country that they give the trade fairs. Q: With the Indo-Lanka agreement coming up about ensuring qualification, in any private sector recruitment process the investor or the company is supposed to hire qualified people as opposed to the Government getting involved in checking qualifications. What would be the solution? I find that in many cases, even in the tourism industry right now, all the big hotels are hiring managers from outside Sri Lanka because we don’t have a supply of good managers within the country. In addition, the lower level workers in the hospitality industry, in the immediate future we need to have 100,000 people because our population is very limited and we have found the our unemployment rate has come down to 5% of the total labour force and most of the people are working outside Sri Lanka. We don’t have a continuous supply of quality people and it will become a big problem for anyone who is planning to invest money in Sri Lanka. Thus, my personal opinion is, as Hilmy correctly said in the first slide of his presentation, the love affair with Sri Lankan workers has to go away, you can’t do it with that. Q: The biggest challenge the small-scale producers talk about is the need for capital investment. If you are to think of upgrading your products to investment and raising their capabilities, where is that capital injection going to come from? Is it going to come from the State? If you look at the Budget last year or in the previous years, it has been very low. Are there opportunities for the private sector to bring in investment? What kind of mechanism is going to work in that? Malwatte: An EXIM bank has been proposed in the Budget and I think they have already started working on it. While that is coming, the EDB is actively talking to the commercial banks to see whether they could give 10% to 20% of their portfolio only for exports. At least the export community will be having access to finance. We are also doing startups for 1,000 graduates. Again we will be working with universities and university incubators, so graduates who have excellent ideas will be helped through State banks. Q: When we import tea for blending purposes there was a concern that low quality tea could imported and exported under the brand name of Ceylon Tea which can have a negative impact on the credibility built over so many years? De Silva: There are restrictions on imports. We are not allowed to import any type of low grade tea if there is minimum quality which the Tea Board approves. There is a panel which looks at all these samples for their approval. Q: We have forums for Ease of Doing Business and Exporters, but on the other side cost of doing business is increasing. We have various types of taxes, wages issues, energy. So can we have a forum to address the cost of doing business? Wijewardena: In fact it is very high in Sri Lanka, we have to admit it — because we are rated very low in Ease of Doing Business all the indexes calculated by the global community. Mostly, what it needs is to go for a massive reform program, every sector to facilitate the industry-led businesses. Without doing that I don’t think we can invite foreign or even the local businessmen to take an active role in developing the country. Q: Setting up a fund to buy brands. What would be the audience response if it is to be on tea, apparel or any other sector? How should Sri Lanka approach? Should we leave it to the private sector as part of their business strategy acquiring brands or should Government set up a fund? The thought provoking thing Hilmy asked was, are we challenging the norm and the policy? There’s never been a support to build exporters despite all the talk. Who is talking about policy here? Who is challenging policy? Do we have policymakers in this audience? No one challenges policy. In today’s context we have a coalition political environment where there is even more confusion. Fortunately, we now have someone at the helm of the EDB changing the norm a bit and inviting the private sector to be partners rather than policymakers telling us what to do. We can talk about everything, but export policy is not in place. When do we address that? I don’t think we are discussing the confronting thoughts that Hilmy raised and we are talking about the micro issues here. What we really need to discuss is that if we are to leapfrog, in my opinion we need to have political leadership. We really need somebody who would actually lead this exercise. I don’t see that happening at the moment. For example in the late ’80s when late Lalith Athulathmudali was in charge of exports, trade and shipping, he was really involved and was passionate about exports. Being an exporter he has interviewed all of us and discussed the subject very thoroughly, so we don’t see that happening at the moment. The other issue is education. Do we have the people who are skilled to do this job? At the moment we have a severe dearth of people. What can we do at the national level? Then we need to put the country on an export platform. As Malwatte mentioned, just like how we eradicated terrorism — this should be a war. And we need to create that platform for exports in everything we do at this stage at school level, university, technical and even to the public community. There should be a major mechanism to communicate this to the people, so we create a platform for exports to get out of the situation where we are in. All the gentlemen touch on policy and I agree with you. Another area I want to bring out which Hilmy brought out on what was the success story of Vietnam. There I think they invited some of the global players to come to the country. The IT sector is one that we already have global players listed in New York Stock Exchange and if we can attract some of the other players also to come through IT, I think we are talking about the IT hub in Malabe. To that location, encourage more private universities to produce IT graduates. We will have another sector which adds a lot of value to exports. Because services export is as good as manufacturing. I strongly believe in what Hilmy brought in. The EDB should also think on a breakthrough strategy where they go and meet the boards like Microsoft, CISCO whatever the global brands and invite them to come to Sri Lanka providing them whatever the concessions required. Once you do that for a few players, others will also come. This was very successfully done for HSBC to setup in Sri Lanka. Often times when we have this discussion, it boils down to labour and lack of skills and it’s linked to education. I disagree with that view because I feel that we need a new thinking when we talk about labour as well for two reasons. One broadly on the concept of education; while there is a role for vocational training, education has to be free and free to even explore irrelevant things. But more related to the discussion we are having is, what are we doing with the knowledge and skills we already have? If you like to look at the capabilities that we have and try to build something out of it, the labour that we have in Sri Lanka is still dependent on agriculture and fisheries. The knowledge that we produce within those two sectors is not taught in schools, it’s passed through generations and it’s through people engaging in a certain lifestyle and livelihood pattern. Linking that into an export strategy of course they do have challenges in networking and taking up scaling and so on. It is also important to understand historically how regional bodies have shown success in this area — namely Korea. They didn’t have anything after the war. In fact, all they had to serve was the hair of women which they made it into wigs at that time. At that point they went to the World Bank trying to get funding for the petrochemical processing industry. They did not get funding for it. In the meantime they were exporting housewives. They realised that Germany was the place. They went and spoke to the Germans; they gave the funding line as well as technology wherewithal to build these petrochemical companies. At that time those companies morphed into the semi-conduct giant we see today, the Hyundai, Memory, Samsung and so on. However, all of that was pioneered by the Head of State, whom they met every month. Without that sort of leadership, we don’t have any examples. Confront the brutal facts. We need a category invader today in order to expand our exports. Obviously there are category invader opportunities. If you look at the Fortune 500 top 25, you will see 10 companies in energy and five to six automobile manufacturers. Both these sectors are going through a revolutionary change in this decade, and this is an opportunity that we should never miss. We should make use of this opportunity and try to bring in green transportation and energy for green transportation. What we receive the most valuable thing free every day is ignored and we lament on its incapability, which is Rs.3 trillion worth of solar energy every day. In 2015, we have wasted more solar energy than the public debt we have taken. Our only way forward is value addition and R&D. These technologies are available; what we want is adaptation of these technologies. If you look at the two success stories, solid tyre industry and the garments, the two key elements were in joint ventures, marketing and technology. I think that’s the only way forward for us with all the limitations we have. We cannot plant another 35,000 acres of cinnamon in 10 years even. We can change our agricultural base, so with limited supplies, value addition, technology and marketing is the way forward and if you want to take that quantum leap we as the private sector have to invest and Government should only do a facilitation role and have a level playing field. Food for thought was on the labour, there is a lot of unskilled labour and labour shortage in this country. There was a lot of resistance to this ETCA agreement Sri Lanka wants to sign with India, but don’t you think it’s a good idea? When you have more professionals who have knowledge workers, intellectual capital coming down, it would help the industry to grow alone. You can look at not only the country but SAARC, the entire local economy, to showcase Sri Lanka. What about the brands you are talking about on a much broader perspective, not only investments, but also the intellectual capital to come over? The possibility of Ceylon Tea in the Geographical Indicator took a lot of time. I don’t think you have invested a lot of time and energy building the Ceylon brand name. Now if you move to another name, you will lose the Geographical Indicators forever. As an outsider, there is an elephant in the room which is called the exchange rate. I think Sri Lanka needs to resolve what the fair exchange rate on import is and export business. Lack of private sector investment in education is another area. If Sri Lanka is sending children to learn medicine in India, I think the same way private universities can be set up here too. I think these are some of the possibilities I see as an outsider. Q: People spoke about leadership, I think what late President Premadasa did with ‘export or perish,’ we don’t hear that anymore. Two people rose about political leadership, do you agree? Hilmy: Given we are currently particularly looking at a quantum approach I think we need that. What we need to be doing is spending even at the highest level of the country, the Ministries further down, I think we need to be spending a lot of time in strategising thinking because these answers are not going to come easy. I feel from the highest level down we should be doing less work on grandstanding, opening various things and spending time on strategising. If you look at a Minister’s diary today, most of it is ceremonial, where is the time for strategising? Ideally, they should be locked up in a resort somewhere with stakeholders and looking at the numbers and debating. I think as a country we are not spending enough time on that strategising part. We expect quick fix solutions and grand statements to come up. Malwatte: I just want to assure the exporters and policymakers who are around here that the EDB does not have an ‘ohoma yang’ approach. We are very proactive and I will take the challenge with my officers already here today. There are about 10 exporters with $100 million value, EDB will take that challenge, I may say two to three years we will make it to 20 and that is where EDB will show our results. 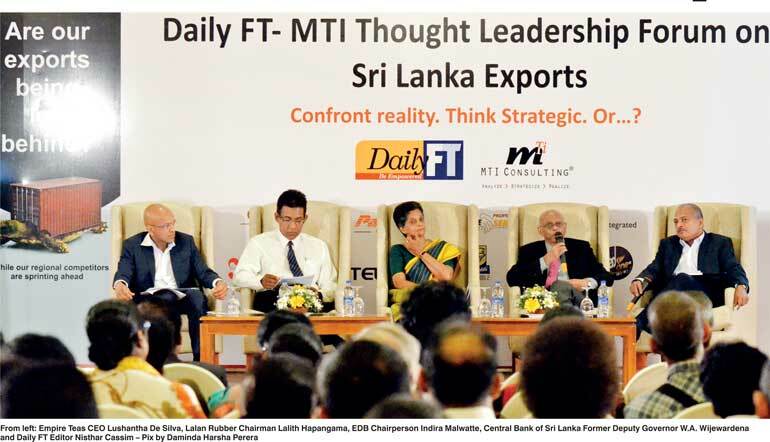 MTI’s thought leadership forum on Sri Lankan exports was powered by MTI Consulting and Daily FT. The sponsors for this event were People’s Bank, EAP Group, Pan Audio, Sarva, Sign Tech, and Teleview. MTI is an internationally-networked boutique management consultancy that enables clients to ‘analyse> strategise > realise’ profitable business opportunities. MTI advises clients on strategy, re-structuring, corporate finance, HRM and marketing, while its services include research, analytics and executive search.